Mike Stern, Ravi Coltrane, Rocco Prestia (Tower of Power), Larry Coryell, Jeff Berlin, Stu Hamm, Maria Excommunikata a.m.o. An artist of incredible depth, talent and determination, she is not only a drummer but also a composer, arranger and singer. Her CDs made it into the top ten of the US Gavin Jazz Charts and won her many awards (a.o. Bavarian Cultural Award, Int. Jazz Award Burghausen, Munich Music Award). As a performer and teacher, she has travelled around the globe – Europe, U.K., USA, Japan, Bahrain, Egypt, Malaysia, Indonesia, Thailand, Jordan, China, Iran and the Gazastrip – just to name a few. Always driven by her vision and the courage to press forward and expand the world of music, she has been studying south indian music with the living legend Padma Bushan T.V.Gopalkrishnan for many years. This has added a very unique and interesting aspect to her drumming and music. She has worked with carnatic master musicians like Guruji T.V. Gopalkrishnan, Vaidyanathan Suresh, Rajhesh Vaidyha, Sriram Parthasarathy a.o. and recorded for the famous Bollywood producer Bappi Lahiri. Currently she tours with her band NOISY MAMA in Europe and India, works as a studio and live drummer, producer and composer and founded her own record label ‘Noisy Mama Productions’. 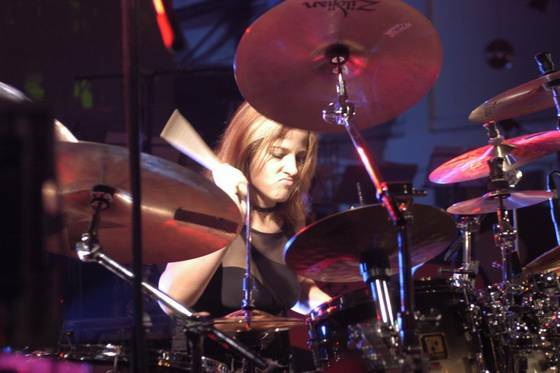 On the teaching side she conducts worldwide drum workshops for SONOR, ZILDJIAN und ROLAND, and is a regular guest teacher at various music colleges (MHS Berlin, MHS Munic, Insitut Musik DAYA, Jakarta).